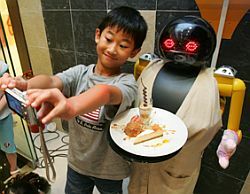 By Ohashi Jozu, TOKYO – Japan has shown China it is superior once again with Japanese technology giant BB FunCorp’s unveiling of Smorgasborg, the Gastronomic Cyborg yesterday at Denny’s. Many weaklings in the audience vomited profusely when the saw the dishes Smorgas, had made. “Oh my God,” said Dale Tarran, from America. “I..I don’t think they should let that robot cook,” he went on. Smorgasborg was invented by the award-winning Japanese division of Mr Boo Boo Takanatsu and John, an Assistant Language Teacher, from Indiana. Smorgasborg prepares excellent Japanese and Western dishes utilizing Japanese microwave and semiconductor technology. He zaps dishes with his eyes and cooks them right in front of your startled guests. “I…we didn’t know how to get it out of our house,” said Bob who is American. “We didn’t know how to turn it off,” he went on. Japanese manual instructions for Smorgasborg can be very complicated for Western country’s people because they are written in Japanese. Also, Smorgasborg does not like to be touched. “Japan is leading the way to a colorful new shiny,” says Ohashi Taro, a spokesperson for FunCorp. “We should be happy and welcome his great dishes,” he went on. Smorgas has spooked some in the culinary community after he ate them. “Unfortunately, no, my husband isn’t able to comment on your article as he was eaten,” said Mary from Utah. Smorgas enjoys wide-ranging tastes and utilizes iron grip technologies to clamp on to his victims before adding a dash of his favorite seasonal spice. “This product has killed, maimed and insulted over sixteen thousand people in Japan since it was released last week,” said Bedford Towne, an analyst for prestigious Caribbean think tank MyGoodies. “So it won’t be released in the US until around Christmas,” he went on. This entry was posted in Exclusive!, Japan, Stories For Bottoms and tagged bb funcorp, cooking, cyborgs, dennys, Grande Chef Otto, Japan, japanese food, japanese robots, robots, smorgasborg. Bookmark the permalink. oh jeeeeeez! I want one.